1. Cream sweater, from Zara. 2. Polo shirt, from Weekend. 4. Cream/beige/white sneakers, from Lacoste. 5. Bicycle necklace, from the Chinese supermarket. 85% of the time I'm wearing black, blue, grey, brown... darker colors. And I thought about mixing it up by trying a lighter palette. 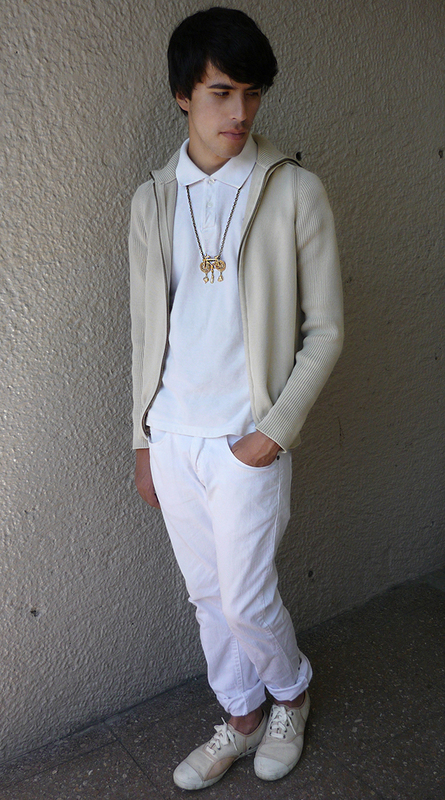 I saw an all-white ensemble on Tumblr or something and that inspired this look. The thing was... I felt it was a little boring so I added cream pieces and the gold bicycle necklace. I found that bicycle charm on my favourite Chinese supermarket and it was broken or something because it turned out super cheap, like really, really cheap (half a dollar or less). The only thing I had to add were two hooks to make it a necklace. Pretty cool, huh? Now, I really don't know if this lighter palette is a good one for me; it's weird and light and clean but don't know if it's really me. I'm a darker clothing kinda guy. Still, I had to try it and the results aren't bad, I think. // El 85% del tiempo uso ropa negra, azul, gris, café... colores obscuros. Pensé variarle un poco e intentar una paleta de colores más clara. Vi un conjunto todo blanco en Tumblr y eso me inspiró a crear este look. La onda fue que era terriblemente aburrido, así que lo aderecé con un par de prendas color crema y un collar de bicicleta. Encontré el colgante de bicicleta en mi súper chino favorito. Estaba roto o algo y salió súper, súper barato (como cinco pesos o algo así). Le añadí un par de ganchitos y, voilá, nació un collar. En conclusión, no sé si esta paleta de colores es lo mio. Se siente súper raro estar tan claro y limpio, no sé si me representa bien. Soy más obscuro, ja. Aún así, fue un buen experimento y algo que realmente quería hacer. Creo que los resultados no salieron mal, ¿cierto? In darkness and in light, yours, Hen. Thank you Jay! 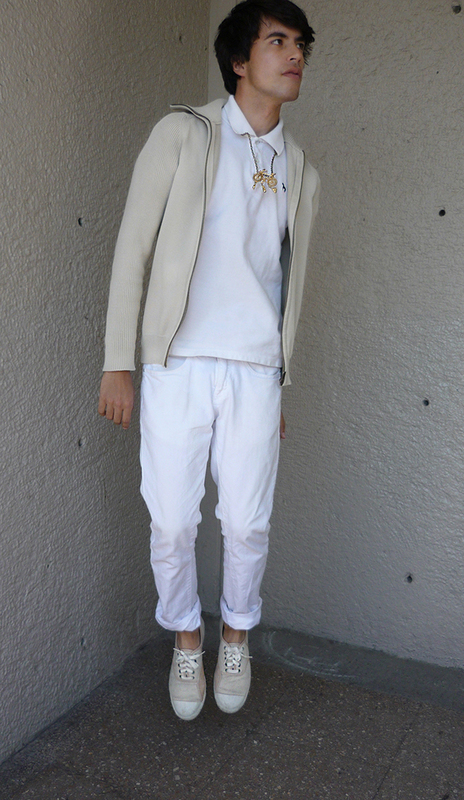 I thought an all white look was a little boring and the cream spices it up a little. He. and I thought that it would be great to have so lovely boy among my followers and be your follower also~! Muy buenas fotos y estupendo look. 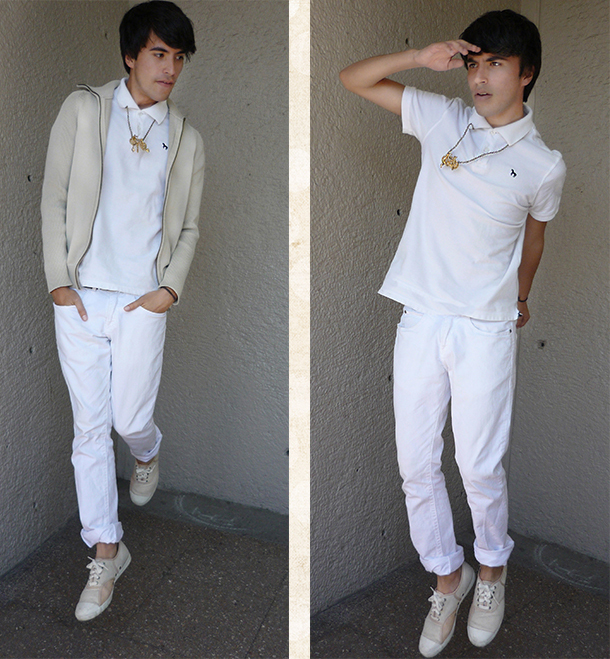 El total look blanco siempre es un acierto, y el collar color oro contrasta de maravilla. ¡Muchas gracias! Normalmente uso colores obscuros pero está bueno variar un poquito. ¡Ha!